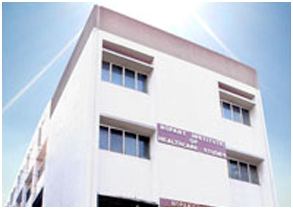 Nopany Institute of Healthcare Studies (NIHS) is situated in the City of Joy, Kolkata. NIHS is a unit of Nopany Foundation which has been found with the mission to impart quality education enabling students to achieve their optimum potential.The group (Nopany Foundation and Nopany Education Trust) has a rich experience of half a century of managing educational institutions successfully and currently run three schools, and two undergraduate colleges in heath and business streams. NIHS was initiated in the year 2004 with an objective of imparting quality education in healthcare sector. The college started with Bachelor of Physiotherapy (BPT) degree program and continued with Master of Physiotherapy (MPT) in Orthopaedics and Neurology,affiliated to the West Bengal University of Health Sciences and approved by Department of Health and Family Welfare, Government of West Bengal. The college has its own physiotherapy clinic with all contemporary facilities for education and healthcare. NIHS is a hub for cultural diversity harboring students from variegated social backgrounds making their experience extremely enriching and memorable! Finally the faculty responsible for the delivery of education is committed to provide rich educational experience to all students in a pleasant and supportive environment. The institute is committed to maintaining a continuous equilibrium of society, science, education and the environment. The principles of Excellence, Efficiency and Ethics are maintained by retaining cultural and social values with simultaneous emphasis laid on modern thinking and education, value of time and fairness to all. By identifying the requirements of the modern world, the Institute plans to implement educational programs to provide career solutions and produce professionals who will prove their worthiness as capable and efficient individuals, making our country proud. NIHS also has a commitment of making university education accessible and achievable to a wider section of society. Our preparatory courses, entrance schemes and student support programs encourage this objective! Commitment to personal and professional development of individuals (Staff members, Students and Faculty) throughout their entire carrier. Improvement and continuous up gradation of course curriculum characterized by significance, relevance, excellence and rigor to meet the growing need of the healthcare sector and create world class professionals. Acquisition of State-of-the- Art skill and improvement of infrastructure, conducive to excellence in the learning and character building.